Which Records Retention Process Works Best For Me? Record retention policies exist to ensure a thorough and correct history of finances, medical records, and other sensitive information is kept intact. Legal institutions, healthcare organizations, education systems and more are required to retain certain files and pieces of information to maintain a level of historical integrity. When organizations fail to keep accurate documentation of their transactions, practices, and clients, the consequences can be severe. Ranging from fees to lawsuits to audit failures and tax adjustments—throwing out documents too soon can end up being a costly mistake. But with laws for each industry coming from various institutions and agencies, it can be difficult to keep track of what needs to be shredded and what needs to be kept to comply. 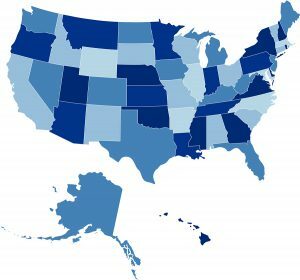 Check this list of state by state record retention guidelines for more information on how long to keep records at your business. What Is the Best Way to Manage Records Retention? Every industry operates under different retention laws, as different types of information are to be kept for different lengths of time. Depending on the types of information your organization handles, there is a good and bad way to manage your retention schedules. Some industries deal with physical paperwork frequently. 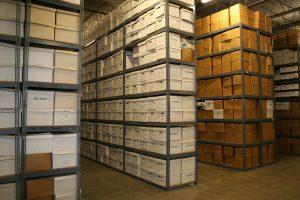 If your organization keeps hard copies of paperwork requiring long retention periods, offsite document storage is an excellent solution. 1. Before your boxes are picked up for storage, organize them by their retention periods. 2. Your storage provider will pick up your boxes and label them with bar codes based on the data you have given them. 3. The barcoded labels are tracked by the storage provider in their database so they can notify you when the retention period is up and it is time to destroy the documents. 4. An onsite shredder or partner provider can shred your papers on site, so all you have to do is save the certificate of destruction for proof that your documents were disposed of properly. Whether you frequently refer to your documents or they just sit around collecting dust until their expiration date, offsite storage services will keep you in compliance and without inconveniencing your daily procedures. There is a huge variety of document management softwares on the market to help companies of all sizes in any industry store and track their files and data. Scan your files and manage them digitally. The software can establish and track record retention periods automatically. With version control, indexing, and retrieval services, tracking and managing electronic documents and disposing of them properly is simple. Digital space costs less than the office space used to store physical files, and with cloud storage capabilities millions of files can be stored at very reasonable rates. Each company will find its own way of storing and managing records. To initiate a solid document storage system that will efficiently support your records retention program, contact Record Nations. We offer a variety of records storage options to meet the needs of any business. Call us at (866) 385-3706 or fill out the form on the right to get in touch with one of our records experts.